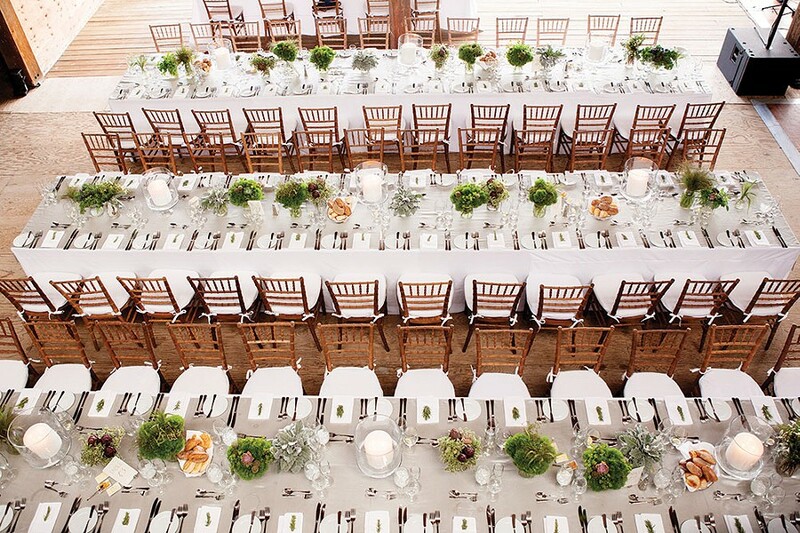 The dinner setting from a wedding at Grasmere Farm in Rhinebeck planned by Lydia Bailey for Charmed Places. Just like a symphony, a wedding requires carefully orchestrating myriad details into a melodious whole. However, almost as much work, time and expense can go into a wedding's preparation. Most newly engaged couples are neophytes and even knowing where, and how, to start the planning process becomes overwhelming. Family dynamics add further complications. Luckily, the Hudson Valley is home to some of New York's finest wedding planners. Here is essential advice from seven of the most experienced in planning and executing a successful wedding celebration. It's not very romantic, but it's the most repeated advice from wedding planners. Before you do anything else—investigate venues, fall in love with a dress, or start taste-testing menus—you need to establish a budget and have a realistic view of what you can actually afford. The average Hudson Valley wedding costs about $50,000. "The first tip for planning a wedding is knowing what you can afford and want to spend," advises Mary Beth Halpern of Events by MB. "Do some research and work with a realistic guest list. Speak with the families and see how to balance some of the guests they want to invite." Many planners also advise to not count on family member's contributions. Often, when hearing of an engagement, well-intentioned relatives pledge financial assistance, but unexpected demands can keep people from following through. This leaves couples scrambling at the last minute, creating stress and resentment where there should be joy. "Know your limits without help," confirms Karin Hlywiak of Cinderella for a Day. "That way when a family does contribute financially, it becomes an added bonus." Hlywiak suggests couples break their budget into detailed subcategories, e.g., venue, catering, and even decor. Cathy Ballone, of Cathy's Elegant Events, advises clients to leave a $5,000 to $10,000 budget cushion for unexpected costs. "Things always happen. Be prepared." 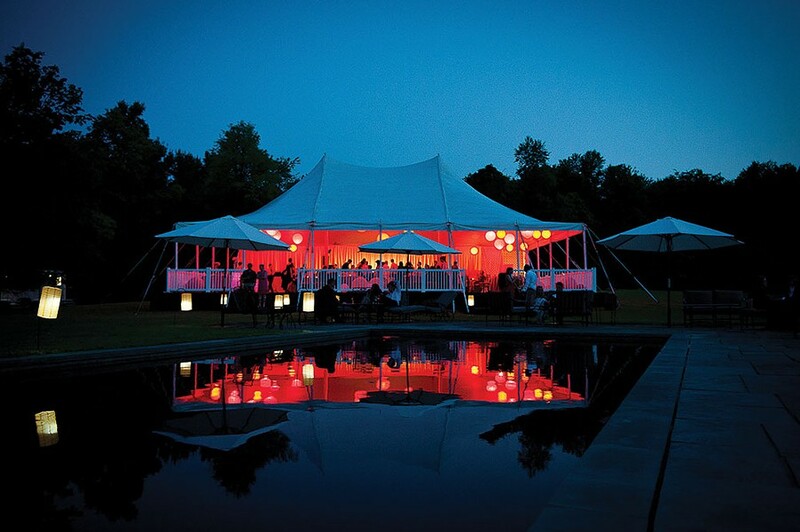 The reception tent from a wedding at a private residence in in Gallatin planned by Mary Beth Halpin of Events by MB. Once you've established budget and headcount, "prioritize, prioritize, prioritize," commands Joann Provenzano, owner of What Dreams Are Made Of. She has clients make a list of their most to least important details; telling them to forgo bridal shows and make individual appointments with vendors instead. "You want to have live, face-to-face contact before you hire any vendor. Personality is very important." "Do your due diligence," advises Lydia Bailey, of Lydia Bailey/Charmed Places. "Research all of the costs involved before committing to a venue or any other vendor. This includes the essential costs as well as non-essential costs." After some research, "revisit the list to see if priorities need to be reorganized based on budget goals." When assembling a roster of potential vendors, do a thorough cost/benefit analysis. "For any vendor, get as specific an estimate as possible and then try and compare oranges to oranges, not oranges to apples," says Halpern. "A venue which does its own catering and gives you the tables, chairs, plates, etc. doesn't compare exactly to one which doesn't include anything." Make sure any staff you hire can work well together to prevent miscommunication on your wedding day. With nontraditional venues (think the barns, vineyards, or stately old mansions so popular in the Hudson Valley) most details come a la carte. You most likely will have to rent things like linens, tables and chairs, and even bathrooms. You also may need liability insurance. "Couples don't estimate how much everything is going to cost," warns Hlywiak. "There are a lot of little things that go into venue weddings and it adds up quickly." Ballone advises couples to view at least two venues and have a third-party professional, whether a planner or caterer, look over the contract before you sign. As a neophyte, "there's always some detail you haven't considered," she warns. 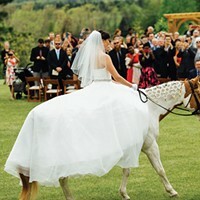 Most Hudson Valley venues (80 percent are outdoors) require a "Plan B" for unpredictable weather. Again, a tent or back-up indoor space might not fit into your romantic vision, but "having a Plan B keeps you from worrying," advises industry veteran Jeanne Stark. "Then if it rains, it rains. You'll be fine." Stark's company Hudson Valley Ceremonies, offers couples a complimentary starter planning session to establish a budget; she then steers them toward appropriate venues. Once you've established a date and venue, send out save-the-dates by post or e-mail. A wedding website, with links to accommodations and as much information as possible, is always a good idea. Make your intentions clear from the beginning—let guests know whether children are welcome and the level of formality to be expected. Research accommodations near your venue and encourage guests to book rooms well in advance. "Hotel room availability is always an issue in the Hudson Valley," warns Hlywiak, "and many won't let you 'block' rooms anymore." Websites like AirBandB, VRBO, and even couchsurfing.com can help when traditional accomodations are exhausted. Hlywiak also suggests clients consider venues that can accommodate overnight guests ("there are lots of hidden gems out there") or ask if venues can recommend accommodation. "Often venues will have relationships with private home owners nearby who can rent four to five bedroom houses for a weekend." Additionally, keep transportation in mind while planning. "Remember," reminds Provenzano, "there's no hailing a cab out here." Be mindful of driving distances between venues and accommodations, or plan to hire a shuttle service. Natural beauty makes the Hudson Valley a popular destination wedding locale. Consider taking advantage and spreading wedding events over an entire weekend. It means some extra work, but has added benefit. "Planning for a whole weekend wedding," says Hlywiak, "gives families additional time to bond." Sample two to three menus and look for a caterer "you can talk to," advises Stark. "You want to work with someone who is willing to work with you; someone who can explain things and will throw out suggestions. They shouldn't try to change your mind. They should try to understand what you and your family are going to love." When pricing caterers, don't forget to consider extra costs. Alcohol often isn't included in the catering menu. Remember, there will also be tax and gratuity added to the caterer's final bill. 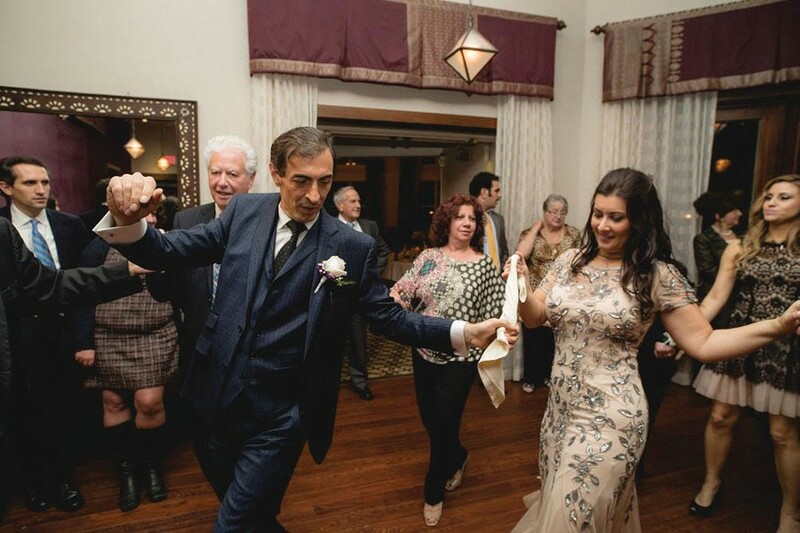 Greek wedding dancing at a reception at The Emerson in Mount Tremper. A photographer is the most important (and undervalued) day-of wedding staff a couple will hire. "Keep in mind, your wedding photos will outlive you," says industry pro Susan Knapik, who combined her military and design backgrounds to become Wedding Assistant on the Hudson. "Find an actual wedding photographer who knows the candid moments and the formal. They should be able to tell the story of the day. They also have to work autonomously and manage their timeline themselves." Stark advises that good wedding photography is 50 percent skill and 50 percent personality and warns, "Don't get assigned someone. Its a very intimate relationship—you want someone you could go out to dinner with." A DJ needs to be a good master of ceremonies and he or she sets the tempo for your reception. Read reviews carefully; look for someone who has done multiple weddings and has a strong reputation. On the other hand, if you want a live band, don't go by reviews. "You need to experience them live," says Hlywiak. "Go see a showcase." If that's not possible, "they should at least have some good footage online." While live bands are often more expensive than DJs (you must budget for each member separately), according to Knapik they tend to "be more interactive and make for a really fun party." "If it's not important to you, leave it out," advises Knapik. This rule goes for décor, ritual, and even ornate invitations. "A lot of wedding traditions have archaic origins and are somewhat irrelevant." Knapik, who specializes in monthly, "benchmark" meetings, also suggests DIY projects (like hand-dipped napkins, signage, and place cards) be started at least six months in advance. "The last thing you want is to stay up until 4am the night before your wedding," she warns. Also: "Go to your florist with a number, not a flower, in mind. Be open to substitutions." Florists are artists with an impulse is to make your wedding as beautiful as possible. Make sure their vision fits within your budget. "Don't pick a dress before you pick a location," advises Stark. And, once you've found a dress "walk around the store a lot. Make sure you can move comfortably." Most wedding planners offer a variety of services—from long-term planning to day-of coordination—and their knowledge makes them a cost-effective wedding expenditure. An experienced wedding planner can be a sounding board and "tie-breaker" when emotions run high. Their job is to help you bypass pitfalls on your journey from ring to alter. Even if you can't budget for long-term help, hiring a professional to do day-of coordination can free you to enjoy friends and family, and all those details you worked hard to get right. Ultimately, a wedding planner can refocus you on what matters. "Take a breath," reminds Halpern. "Know that the most important aspect is that you will be getting married and sharing the day with loved ones."